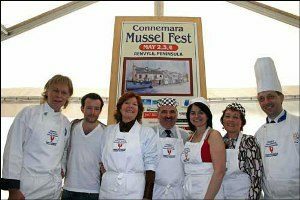 The hub of the festival is in Tullycross village where renowned professional chefs will demonstrate the cooking of mussels and other local produce. The amateur, children’s and celebrity mussel cooking competitions are a major highlight. Other activities include guided walks in Connemara’s majestic scenery; dramatic presentations and children’s storytelling; talks on beekeeping, foraging, organic vegetable gardening, local archaeology and other topics of particular relevance to the cultural heritage of the area; a wine tasting evening; a country market offering the best of crafts and food and an art exhibition featuring work by local artists. There will also be activities for children. In the evenings there will be a variety of music available in the local pubs. The Connemara National Park is close by as well as beautiful beaches and majestic mountains.